In 2012 the EPA issued a grant to the Louisiana Coastal Protection and Restoration Authority for the purpose of combating hypoxia. 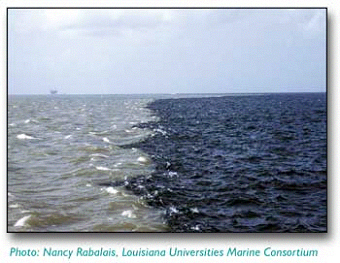 A large area in the northern Gulf of Mexico is called the “dead zone.” The problem is known technically as hypoxia. Mississippi River. Its area varies in size, but can cover up to 6,000 to 7,000 square miles. The dead zone is caused by nutrient enrichment from the Mississippi River, particularly nitrogen and phosphorous. Hypoxic waters have dissolved oxygen concentrations of less than 2-3 ppm. Hypoxia can be caused by a variety of factors, including excess nutrients, primarily nitrogen and phosphorus, which promote growth of algae. As dead algae decompose, oxygen is consumed in the process, resulting in low levels of oxygen in the water. More from the EPA’s Website.